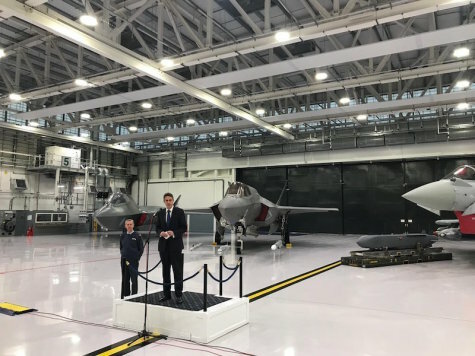 Speaking at RAF Marham, the Defence Secretary announced the UK now has nine F-35 Lightning jets ready to be deployed on operations around the world. The F-35 Lightnings will form the backbone of the UK’s combat air fleet alongside the Typhoon jets, which the Defence Secretary also announced have now been fitted with a state-of-the-art complex weapons suite to vastly increase its capability. Under ‘Project Centurion’, worth £425m over the past three years, the Typhoon now has deep strike cruise missile Storm Shadow, air-to-air missile Meteor and the precision attack missile Brimstone at their disposal. Defence Secretary Gavin Williamson said: “As we bid farewell to the RAF’s first century, we are setting our sights on the next 100 years. Our nation is moving into a new era outside the EU, and our huge achievements in air capability make our commitment to a role on the world stage clear to both our allies and our enemies. The year ahead will see the F-35 Lightning pilots and ground crew continue learning how to operate and maintain the jets in the new centre, which features state-of-the-art simulators, classrooms, and physical aircraft mock-ups. The facility provides a real-life training environment replicating the challenges that both pilots and crew will face in supporting and operating the F-35 Lightning. In addition to the Typhoon and F-35, the Tempest concept fighter jet model was also on show. Chief of the Air Staff Air Chief Marshal Sir Stephen Hillier said: “I am proud to confirm that the RAF’s Combat Air capability has taken yet another significant step towards the realisation of our Next Generation Air Force. With its cutting-edge stealth technology, our F-35s are now ready to deploy on operations and, alongside our combat-proven Typhoon, offer a step-change in our ability to employ air power around the world. “Furthermore, the successful integration of Stormshadow, Brimstone and Meteor on Typhoon completes and enhances the transition of world-class capabilities from Tornado and allows a stalwart of the RAF’s Combat Air inventory to retire from service. The RAF has already trialled its Typhoon and F-35 Forces’ interoperability.